Efficiently remove excess moisture, allergens and unwanted odors from your home with a quality dehumidifier. While conveniently portable, a dehumidifier is the perfect solution to removing excess household moisture. Research the facts and improve the air quality of your home. Dehumidifiers: What Purpose Do They Serve? What Size Unit Should I Use? How Do Humidity Levels Affect A Dehumidifier? What's The Buzz On Noise Levels? High humidity can cause negative aspects such as allergies, stains on your walls or ceiling and annoying condensation on windows and mirrors. Low humidly levels can also be a detriment, causing chapped lips, dry skin and high amounts of static which can be potentially damaging to your electronic equipment. So where's the balance? 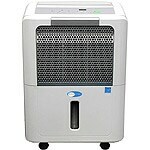 A dehumidifier serves to balance out the humidity within the air. Finding the right dehumidifier can vary from room size, to elevation and location. Research before you buy, and decide on a dehumidifier that best suits your needs. Room Size - To help extend the life-span of your chosen dehumidifier, going with the larger unit (within 100 square feet range; capacity vs room size) will probably be your best bet. Unit Efficiency - Purchasing the proper unit size for your room will prevent the unit from running longer than it needs to, which helps to conserve energy and make running your dehumidifier less expensive. Dehumidifiers are purchased to remove excess moisture from your room, therefore this process means the dehumidifier will drain this excess water. Depending on the unit you buy, there are a couple different ways it could drain this water. Buckets - The simplest of the dehumidifiers will offer the internal concealed container that will be filled with the collected water, which could need to be drained approximately once a month, depending on the conditions. If the container is to become full before you are able to empty the drain bucket, the unit will shut itself down until the bucket has been emptied. Drain (Gravity) - Most all dehumidification system support the option of permanent water drainage with a water drain hose connection. This allows for the water to continuously drain out via gravity. This excess water can be drained to a floor drain, outside or to any other drain point. Condensation Pumps - Also available, condensation pumps will provide the capabilities of draining your dehumidifier in an upward direction to be sent out of a window or door. 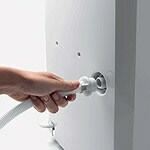 They work with a flow switch that allows you to run the pump only when you need. Buying a unit with a large drain tank capacity means that you will empty the tank less frequently and the unit will work faster and more efficiently. Some units offer a hose connection which will allow you to divert the water collected directly to a floor drain which is more convenient if the unit will be placed in an unattended area. Make sure to check out the features and specifications when doing your shopping to see the draining capabilities as well as the tank capacity. The effectiveness of your unit will be based upon the level of humidity in the room you are placing your new dehumidifier in. If you reside in a humid area such a Louisiana, where the humidity is above average, the dehumidifier will have to work harder and run longer. An area like this will require a stronger, larger unit that will be able to withstand and defeat that level of moisture. Keep in mind the type and size of the room you are trying to dehumidify. There are certain models that have been designed specifically for these spaces such as a basement or underground living area. Much like your kitchen refrigerator, dehumidifying units have an internal compressor that compresses the refrigerant within them. These units also contain a motorized fan. Both features will create a fair amount of noise within the area of operation. While there are no truly "silent" dehumidifiers, some may be equipped with the technology to run more quietly than others. Compressor Technology - The most common technology used by a dehumidifier is a compressor. Compressor units have coils that compressed air and/or refrigerants move through. A fan within this unit will then pull the moist air from the room over these cooled coils, which causes the water to be cooled and condensed. The dehumidified air is then pushed across over the hot coils where it is warmed back into room temperature and released back out into the room. These units are extremely effective. Thermoelectric Technology - Units that use thermoelectric technology utilize an electric current that is passed through two dissimilar metals that transfer heat which causes the same effect as the coils within a unit that uses a compressor. The one benefit in having a unit that runs on this type of technology is that there are no moving parts so a lot of the noise is emitted. While the compressor units offer more efficiency, the thermoelectric units are great for smaller areas as well as offer an almost silent operation. Clean the air filters every 6 months. If you plan on storing your unit away for any period of time without using it, always make sure to drain it first. While most portable dehumidifiers on the market use the standard 110-120 household outlet and require no special wiring, some units still draw a significant amount of energy. That being said, caution must be taken to not overload a circuit with multiple high-energy consumption devices, such as your fridge. What does the capacity of the dehumidifier mean? Dehumidifiers are all rated by the max amount of humidity/moisture that they will remove from the air in a 24 hour time frame. The measurement of a particular unit such as a 40 pint unit, is rated to remove 40 pints of moisture a day from the room it is positioned in. When it comes to defining the capacity of a dehumidifier, this consists of the "drain tank capacity". For example, that same 40 pint unit may remove 40 pints, but the "capacity" can only handle 25 pints. Which at that time depending on what type of unit you purchase is to how it will handle this collected moisture. Can the drain bucket overflow? No, almost every dehumidifier has a float switch to shut off the unit when the water rises within the drain bucket to a certain level. This is a nice safety feature. Will a dehumidifier produce any heat into the room I put it in? There will be some heat thrown off the unit into its immediate environment. Depending upon the size of the dehumidifier the heat that is produced will vary greatly. Also, keep in mind that the greater the temperature is within the room your unit is in the more efficiently the unit will be able to remove the moisture from the air. Sometimes the smaller dehumidifiers have been known to raise the ambient temperature by 5-8 degrees. Make sure to check the specifications of the dehumidifier you are interested in as quite a few of them will cease to operate if the environment becomes too cold. How long will my portable dehumidifier last? Keeping your unit properly maintained will ensure that it has a long life span. Dehumidifiers can last anywhere from 3-15 years depending on the model. Sizing for a portable dehumidifier based on square footage is basically a rule of thumb in all areas except for coastal areas. Coastal areas, the square footage will decrease as much as 50 percent. Also keep in mind the height of your ceiling. These figures are based on the standard 8 ft ceiling. Add 25 percent more to the square footage for 10ft high ceilings and 50 percent more for 12 ft high ceilings. What is the suggested humidity level for comfort in a room? It is recommended to keep the level right at or just below 50 percent. Mold will not be able to grow with the levels below 50 percent. Can I use my air purifier at the same time I am using the dehumidifier in the same room? Yes, neither unit will affect how the other one functions. This is a type of dehumidifier that is designed to operate in temperatures below 65 degrees. Typically these units have an internal auto defrost to prevent ice build-up on the internal coils. Is a portable dehumidifier safe for a child's room? Can it be knocked over? There is nothing that makes a portable dehumidifier "unsafe" for your child's room. These units are plugged in like a standard lamp and does produce water. The water produced would not be harmful to a child if consumed as it is simply distilled water. These units are on casters so they can indeed be moved, but they are fairly heavy weight and would be hard for a young child to move. Is it safe to store during the winter when its not as humid? As long as you have completely drained the unit, storing it away at any point in time will not be unsafe. If you want to keep it out all year round and leave it on it will work whenever the humidity rises should there be a leaky pipe or a quick thaw of the snow outside. Where is the best place to install it? Installation does not have to be in the center of your room, but placing it near the middle would be helpful. Humidity will typically equalize itself in an air space, therefore it is not absolutely necessary for it to be located in the middle of the room. Will it reduce the amount of dust in my home? No, the filter provided with the dehumidifier is specifically there to catch larger dust particles and prevent it from getting on the cold coils and reducing the units efficiency.